If you were raised in the South, there’s a good chance that you grew up with a bridal portrait of your mother or grandmother hanging in your dining room or living room. A bridal portrait is as Southern as fried okra, banana pudding, and sweet tea. It’s a must! Bridal portraits have evolved from mostly formal studio to anything goes. Our brides choose locations that have sentimental meaning to them or locations that are just gorgeous. Most of the bridal portraits we create incorporate the scenery... the mountains, fields, rivers, waterfalls, and wildflowers. The Blue Ridge Mountains of Northwest North Carolina are just breathtaking. Bridal portraits are a once-in-a-lifetime opportunity to have a portrait created separate from the hectic schedule of the wedding day. We have plenty of time to make sure everything is perfect. It’s also great for a hair and make-up test run. Some brides think it’s vanity to have a portrait made of just themselves but that couldn’t be farther from the truth. For years into the future, your bridal portrait will be appreciated and loved by your new husband, your parents, and maybe even your future daughter(s)! 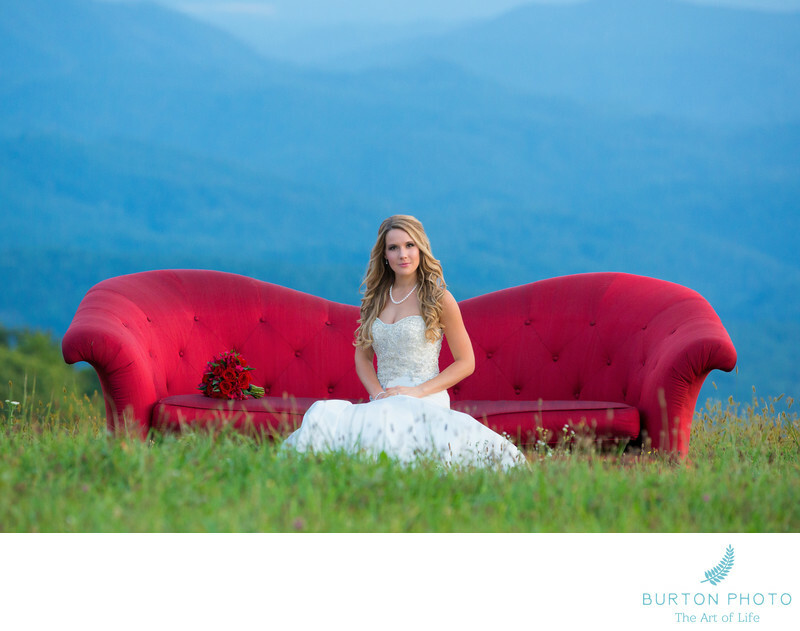 Breanna wanted her bridal portrait to 1) show the Blue Ridge Mountains where she grew up and 2) use the red couch from the bridal suite at her church. With the help of her father and brother, the heavy couch was moved out into a field overlooking the mountains. The rest was just a matter of finding the perfect location, thoughtful posing, and soft, evening light.